In my Technological Trends in Music Education course, one of our guest speakers pointed out that all software is moving to ‘the cloud’ meaning that rather than have to download an application and ensure compatibility across Mac / PC, it’s easier for educators to use programs that run online in a web browser. Web Audio is becoming easy enough that all sorts of cool applications are possible, there’s even a GarageBand clone. 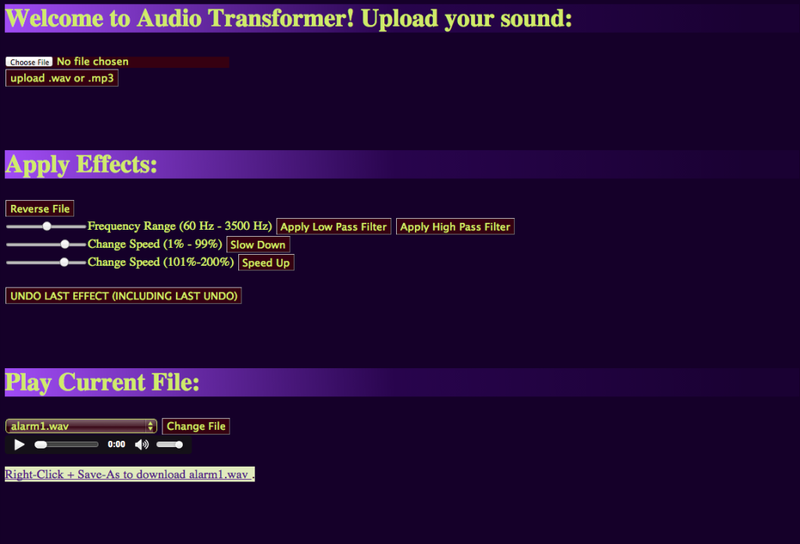 But nobody has made a simple audio editor that I could use in my workshops. Meanwhile, there are plenty of online image editors— pixlr is a fine example—and even for somebody like me who has a powerful image editing program on their computer, sometimes I just wanna make a quick edit rather than load Photoshop which takes a long time. So I started building Audio Transformer with all this in mind. 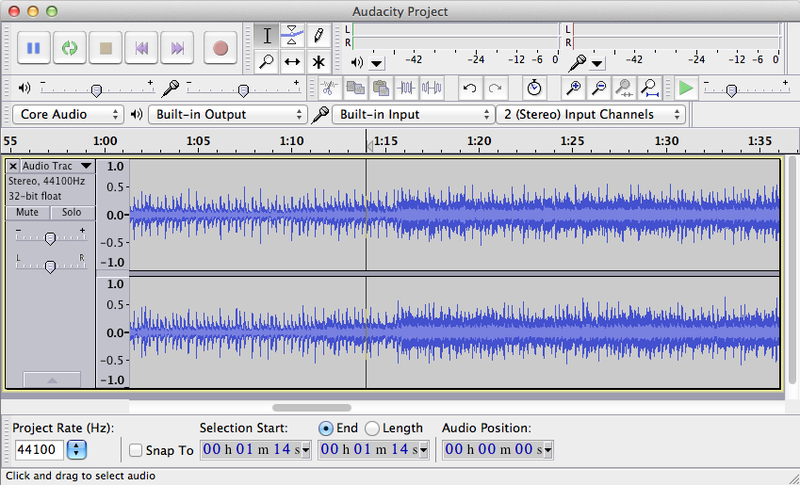 I think there is a great need for a simple online audio editor. I have been looking at SoX and I think it is possible to do all of the editing on the server side. On the browser side, I’m looking at representing the waveform data visually in processing.js and also delving into the HTML5 web audio API. – Automatically send an email “invoice” to the Admin and the User. – Make everything look nice with CSS. – Stream songs on the page. Ideally this could be expanded by grabbing similar data from other independent radio stations to create a database that would be able to recommend programming across a bunch of different stations. I’ve been messing with PHP Data Mapper, trying to set up a database for my little website. I created two tables in the database: Songs and Licenses. Each License is related to one Song (one to one). Songs can be related to many Licenses, or no licenses (One to Many). I haven’t quite made it that far but I did start using github. Bush’s groundbreaking concept is a “Memex” that would extend human memory to provide access to an index of all human information. He describes something called “trails” that would mimic the way the human brain links things together by association. The process seems to have an aspect of automation, but it is clearly steered by a human who defines the creative aspect or search term or other parameters, then sets the machine off to gather some information while the human digests the infos. Trails are then stored for later use, which makes me imagine a hybrid of a search history and an automatically-generated reading list—a nifty way to organize information. Bush believes that if we can reach a point where machines do the heavy lifting of computing and recalling the material, humans—including scientists and mathematicians—will be much more creative and productive. I wonder what Bush would make of the Internet where his article is distributed for free on-demand along with billions of other artifacts of the human race. 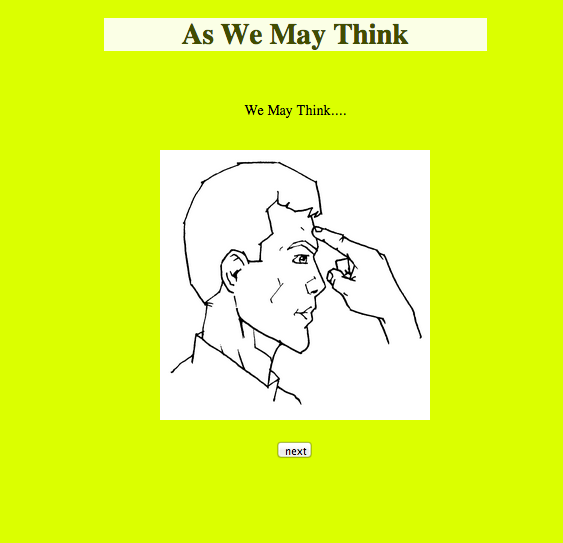 To to make this week’s reading more fun and interactive, I made this hypertext response.